Offer your guests a luxurious aromatic experience they will never forget. Candles provide a great retail opportunity for hotels, spas and gift shops, in addition to making great VIP and guest appreciation gifts. Expand your brand by creating your very own private label or co-branded candles exclusively from Baronessa Cali Cosmetics! Choose a white or black glass container with corresponding box. Select your wax seal color. Submit your logo and desired artwork. * Available fragrances include: Citrus Basil, White Tea & Ginger, Cypress & Jasmine, Cedar Suede & Leather, Pink Grapefruit and many more. **Custom colors/fragrances are available! These candles are 100% made in the USA with quality fragrance oils and soy wax. This allows us to offer you low minimum order quantities and access to a large variety of unique and custom scents. 120 minimum order quantity (Can be split between 2 fragrances). Lead time is 4 weeks from artwork approval. Custom artwork will be submitted to you for approval. 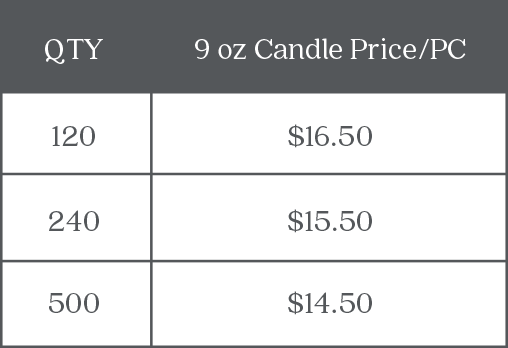 Suggested retail price for a signature candle is $32.00.